Johnny Bonilla had a dream to start and run his own business five years ago. 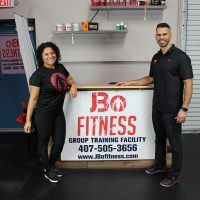 Today, he is the founder and owner of JBoFitness in Kissimmee, a group training facility that takes personal training and applies it in a group setting. Dedicated to building strength and conditioning, JBoFitness guides clients in a significant workout that takes the guesswork out of physical fitness and gets results. Bonilla will be the first to tell you that he hasn’t done it alone. Along with his wife Raquel, he is assisted by the Florida SBDC at the University of Central Florida (UCF) of Osceola County. Bonilla has taken advantage of all of the Florida SBDC’s core services: its no-cost consulting, business training, and access to research databases. With the help of the Florida SBDC, Bonilla and JBoFitness have enjoyed impressive success. "Since starting with the FSBDC, we’ve had massive growth. From our modest start in the courtyard of a local church in 2013, JBoFitness grew into a 1000 sq. ft. space and then in 2017 moved into its current 2750 sq. ft. training facility. Starting out, JBoFitness had seven clients; today we serve approximately 150. It’s been a lot of work, but also a great ride and fun. We’re going to continue with the FSBDC. They have done a great job with us."